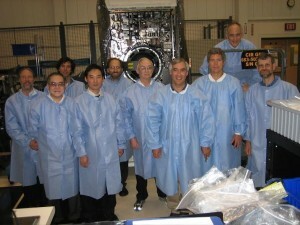 The ACME scientists stand in front of the Combustion Integrated Rack. Dr. Marshall Long is on the far left, and Dr. Mitchell Smooke is fourth from right. Image courtesy of Dr. Mitchell Smooke. For all its Hollywood glamour, Gravity got one thing pretty much right: how fire acts in space. According to Yale Professor of Mechanical Engineering Mitchell Smooke, the floating fireballs that Sandra Bullock dodged are accurate portrayals of the rounded, longer-lasting properties of flames in zero gravity. Rather than using them to thrill audiences, however, Smooke and his colleagues seek to understand how these fireballs work and to apply this knowledge of combustion to solve issues both in space and closer to home. Smooke is a computationalist, solving fluid mechanical and thermochemical equations for the many chemical species that make up a combustion process. To check the validity of his calculations, Smooke collaborates with experimentalists who record various characteristics of the real-life combustion process. If the computational model does not agree with the experimental results, Smooke tries to understand the physics and chemistry of the system to obtain a better fit. In addition to exhibiting this helpful velocity decrease, flames in microgravity produce almost an order of magnitude more soot for a given flow rate, yielding more particles that can be analyzed. Further, the elimination of gravity makes computational modeling simpler. Smooke and his experimental colleague, Professor Marshall Long, have been utilizing microgravity facilities such as drop towers and planes flying parabolic trajectories (aka “the vomit comet”). However, these methods of have drawbacks. The drop tower yields only 2-5 seconds of microgravity time, and the plane only twenty per parabola. Even in the plane, a gravity force of 10-2 g still exists – far from Smooke and Long’s ideal of 0 g.
This group of projects, collectively called the Advanced Combustion via Microgravity Experiments (ACME), consists of scientists from Princeton, Rutgers, Wash U in St. Louis, U of Maryland, U of Hawaii, NASA Glenn and UC Irvine in addition to Yale. ACME is one of four groups of projects that NASA astronauts will conduct from 2014 to 2022. The ACME projects are slated to happen from 2017-2019. 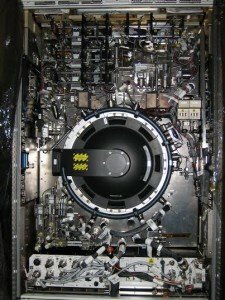 The Combustion Integrated Rack, which was sent to the International Space Station in 2009 to allow astronauts to perform combustion experiments in space. Image courtesy of Dr. Mitchell Smooke. Nevertheless, Smooke doesn’t mind the wait, considering the tremendous potential of the results that he and Long could obtain from this study. A highly accurate model of soot formation obtained from Smooke’s mathematical models that matched the space station combustion data could revolutionize our understanding of soot formation. This understanding could help us design optimal fire safety protocols in space, as well as discover how to minimize pollutant soot emissions back on Earth. Smooke notes that even today in America, half of our energy for electricity comes from the burning of coal. Smooke also greatly anticipates the ACME results because so far, his mathematical models have not fit the data from combustion done in the “vomit comet” as well as he would have liked. He hopes that eliminating the variable of gravity will help with both model fit and with the ease of understanding the weaknesses of the model.